Viyella is a blend of 80% long-staple cotton and 20% merino wool first introduced to the English in the late 1700’s, making it a very long running brand, indeed. In my wardrobe it most often takes the form of a shirt. An extremely warm shirt, usually boldly patterned tattersall or a plaid. 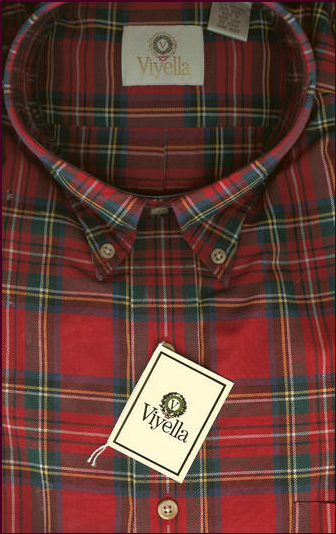 Viyella isn’t limited to shirts, though. You may also find bathrobes, sweaters, trousers and pyjamas made of the good stuff. I think it would make up into some very nice socks. The shirts, however, are an easy addition to your casual weekend wardrobe and pair very well with sweaters and sportcoats alike. Worn ragged with use, a Viyella shirt is just the right companion for a winter’s hunt or a bit of early spring gardening. Especially when worn with a pair of dark olive corduroy trousers that have bagged at the knee. Wellington boots would not be out of place. Pairing one with a tie gives you a bit of a country squire effect. Just make sure that the tie is of equally substantial material. A good wool challis (J Press or Polo) or knit silk, cashmere or… did I mention that I have a Viyella tie? (Ben Silver.) Your Harris tweed sportcoat will complete the picture, as would cavalry twill trousers. Wearing your nicely pressed jeans, a crewneck sweater (in red?) and your suede brogues used to put you squarely in the continental European camp. Throw on your Barbour and you are ready for the farmer’s market. Eat local. Dress global. This entry was posted in Elegantology and tagged Ben Silver, Casual Country Clothing, Dann-Online, Harris Tweed, Polo Ralph Lauren, Viyella. Bookmark the permalink. I looked totally country this a.m. Wellies, long barbour coat, barbour hat, cashmere sweater set and a skirt. A scarf instead of the hat, and I could have been HM Queen Elizabeth II. Ben Silver is a wonderful place. It’s very Ralph Lauren. I like it. Oh! Ben Silver! Now you’re talking. My husband just got the alma-mater gold buttons of Tufts seal which are custom made for BS, for his navy blue blazer. A subtle, barely seen, but lovely addition to that classic apparel item! I best order mine while I still can from the looks of it.